Trying to Stop Smoking is one of the hardest things to accomplish in life. Once you have made the decision to quit the habit, there are a number of methods and aids available to help you stop smoking. One of the more recent techniques that has emerged is using stop smoking laser treatment. What is the Stop Smoking Laser Treatment? 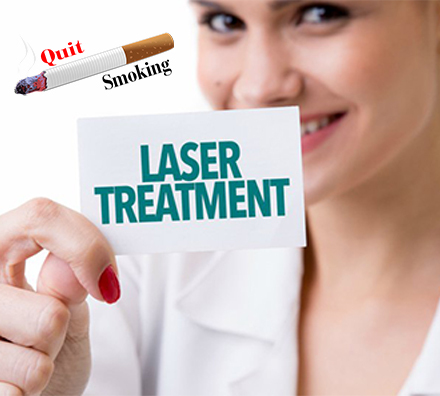 The stop smoking laser treatment therapy is a cutting edge procedure. It works by stimulating endorphins when the pulsating laser is absorbed by your skin and cells at pre-determined acupressure points. If successful, laser treatment will eliminate your urge to smoke. It will also increase your fat-burning metabolism to help mitigate you gaining weight shortly after quitting and further reduce the stress of stopping smoking cigarettes. – Picking a Date to Kick the Habit and don’t change it! – Start to exercise at least three times a week. – Increase the amount off fruit and vegetables you are eating. – Start stockpiling gum and healthy snacks. – Get rid of all smoking material in your home and car. This includes cigarettes, ashtrays, lighters, etc. – Schedule a lot of activities that are not in bars or around alcohol so you take your mind off of the habit. – Clean all of your clothes to make sure you can’t smell cigarette smoke. Although the stop smoking laser treatment has been proven to increase your odds of kicking the habit, no method is fool-proof if you don’t take action to reinforce the fact you are no longer a smoker.